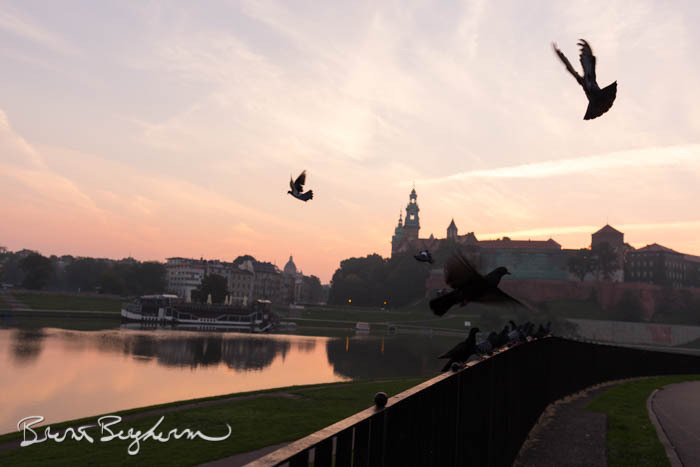 One thing you always run in to when traveling to various cities is pigeons. 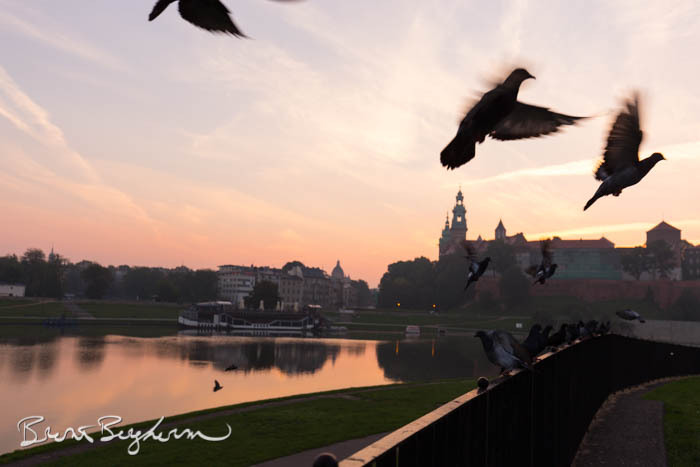 While exploring Krakow, Poland, I came across these pigeons roosting on an iron fence. 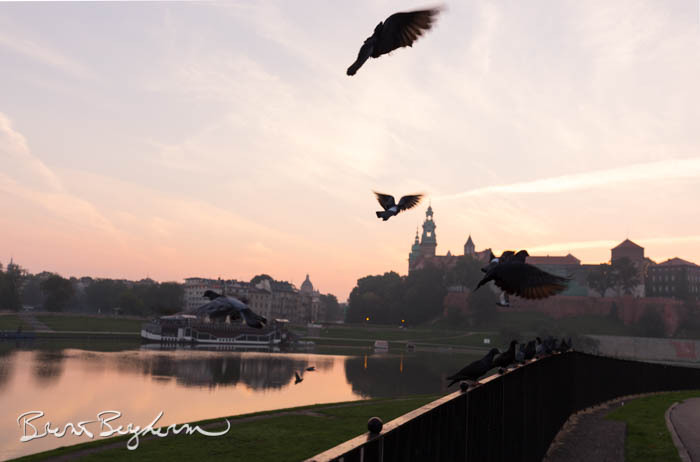 They were perfectly perched with Wawel Castle in the background and the sun rising behind that. A perfect setting for a great shot. 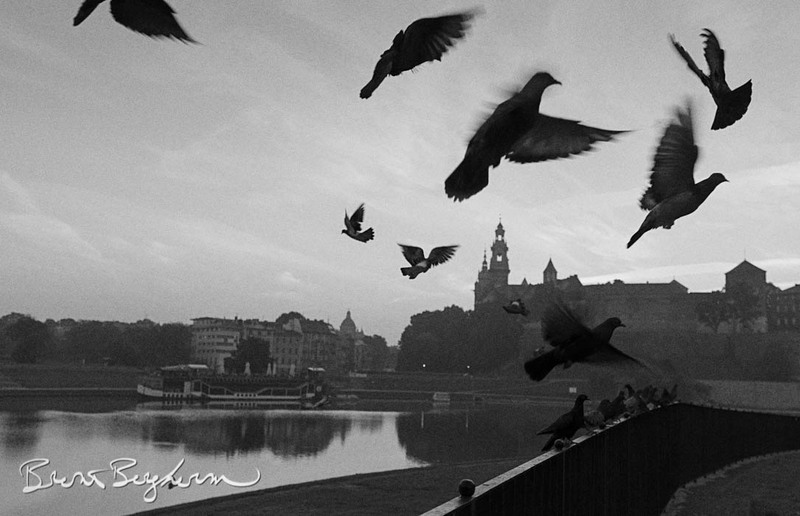 As I was shooting I framed up the pigeons singly and calmly, but I knew I wanted more action too. So I then decided to put the camera (Canon 6D) on motor drive, set the focus to manual so it’d not try and hunt and I just walked along the fence as I shot. Experience told me that I’d probably not get exactly what I wanted and that I’d have to do some more work to fully execute my vision. I chose these three images to blend together in Photoshop, using one image as the base and the others I just used the birds. 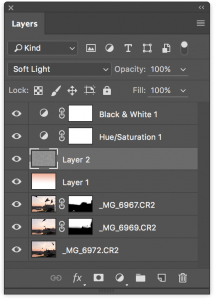 Here’s a view of my layers panel. As you can see I’ve got the three layers stacked right on top of each other, and layer masks are blocking out the parts that are in the lower sections of the images. I also used a bird from one image that was flying over the river area, so I kept that in via layer mask as well. You might think that making the selections of the birds is difficult, but in reality it’s quite simple. I just slightly brightened the top two bird layers making the sky a bit brighter than the base layer. I then set those two layers to a blend mode of “darken” which allows only the darker pixels on that layer to be shown over the lighter pixels on the layer beneath it. And then you just paint in a layer mask to get rid of the bottom stuff and it’s all good. I then moved the two layers around a bit to position the birds where I wanted them, cropped a bit to straighten and tighten the image and I thought that was it. I then decided I wanted to try two more things. Either enhance the saturation, or make it more vintage with a B&W effect. So you’ll see in that layer stack a few extra items. A Hue & Saturation adjustment layer which is doing no good since I decided to keep the B&W version, and a copy of all image layers combined into one layer. This was for adding some high pass filter (9 pixels) and a bit on noise to give the image a more rough feeling. I liked the B&W version best (I usually do) so I kept it. You’ll also see a gradient from white to an orange/pink color. That was to put more life back into the sky if I kept the color version, since I didn’t it just provides a bit of a darkening to the overall sky.